I still find travelling to WA’s northwest as exciting as it was on my first trip more than 25 years ago. With several trips now under the belt and a stint living in Kununurra, there’s one thing that I appreciate more than ever, and that’s timing. Time in the Kimberley is a slow-moving clock that refuses to be rushed! We generally like to be free spirits and not have to make too stringent plans, but the Kimberley is an exception. To begin with, the area is so large that travelling distances between towns and attractions alone needs to be factored into your travels, so timing and planning is the key to maximising your trip. Be mindful that roads around the Kimberley can open at different times after wet season rains which can affect when attractions open. The main towns provide most of the services that you would come to expect of towns their size, but expect delays when items need to be ordered in. Fuel prices can vary within the towns, so it pays to ask around when you arrive for the best location and price. Out on the black top, we allow plenty of time to travel from one place to the next because the Kimberley still has one lane bridges and lots of road trains on the Great Northern Highway. You’ll be sharing the road with these monsters at some stage, so give them a very wide berth. Now if your tow vehicle is a 4WD and you’re planning to travel the Gibb River Road with a caravan, you need to understand that you can’t get your van in at all attractions. Road conditions along the Gibb have improved tenfold since my initial visit, but it’s the tracks leading to the stations where you could come unstuck with a caravan. One option could be to store your van at Derby or Kununurra which will then allow you to tent the Gibb, do a tagalong, or research places along there having accommodation. You won’t be stuck for choices! You’ve got unpowered sites, all the way through to some top notch 5 star luxury. There are several National and Conservation Parks waiting to be explored, so if you plan visiting at least four of these during a four week period, save a few dollars and purchase a Holiday Pass. It allows you to visit an unlimited number of Parks over four weeks. The major Kimberley towns have attractions that can quickly eat into your holiday budget, so you’ll need to allow for it. 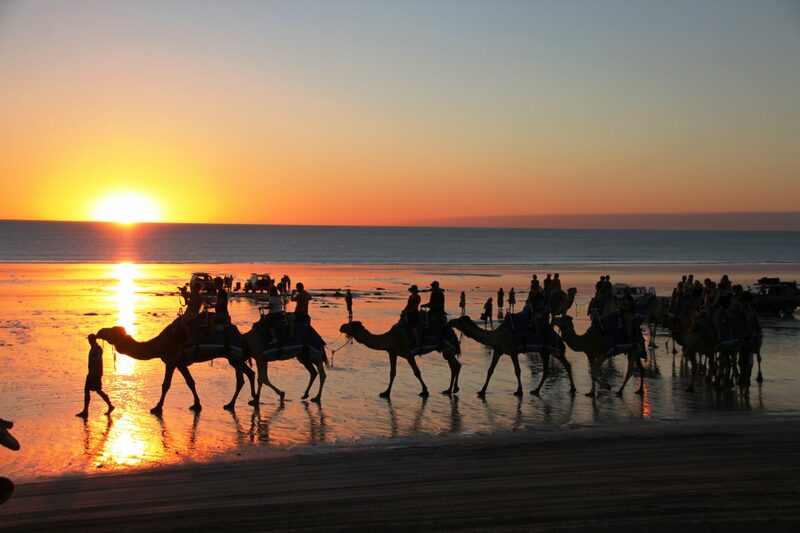 In Broome alone you’ve got a stack of tours; camel rides, pearl lugger sunset cruise, canoeing, hovercraft across the mudflats, and plenty more. Now there was a happy hour with a difference! For only a few dollars, take a look around Broome’s local museum, and allow plenty of time for places such as the dinosaur footprints, Cable Beach, Streeter’s Jetty, and Sun Pictures. And for some pretty special ginger beer, you must visit Matso’s. It’s not difficult to think why the Kimberley gets so busy during the dry season, when an area double the size of western Europe has little more than two dozen caravan parks! 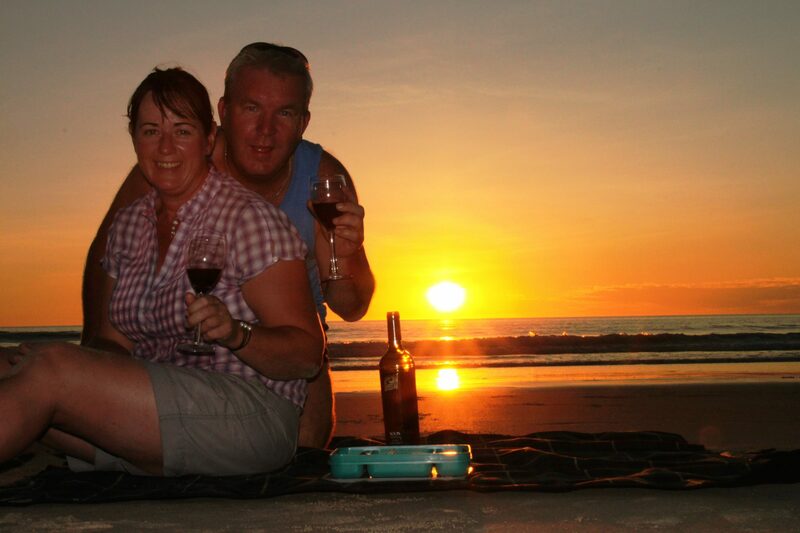 When it comes to places like Broome and Kununurra, book ahead if you’d like your site guaranteed. Generally site costs are the same wherever you’re located in the park, so why not book early and get a shady or waterfront site rather than being located in full sun, as will be the case at some parks. In Broome, caravan parks allowing pets is limited. Only one in central Broome currently permits pets, but they too have a block out period from the beginning of June until the end of August. Overflow places such as the Broome PCYC and the Seventh Day Adventist Church allow pets, so check availability when planning your stay. Free camping options are numerous throughout the entire region with the Dampier Peninsula north of Broome having some amazing spots. This area also has some of the best coastal views in the Kimberley, and for an all-round great holiday destination, the sunsets here are superb. But do your research, as not all attractions permit caravans due to the rough roads. The tides along the peninsula are nothing short of phenomenal as they can get up to an incredible 10 metres. Cygnet Bay offers a Giant Tides tour that enables visitors to experience the massive King Sound tides first hand as you speed through whirlpools. There wouldn’t be too many other places in Australia where you get a chance to witness a waterfall out at sea! If seeing the Horizontal Falls is the highest priority for your Kimberley visit, book this tour first as it fills up quickly, and work the rest of your trip around it. Take the time to review the various falls packages on offer as there’s multiple to choose from. To get the most from this tour, you’re after a large variance in tides, so check local tide charts times before making a booking. Derby has a range of attractions for visitors, but if you’re visiting the Horizontal Falls, base yourself here, as tours are cheaper when compared to leaving from Broome. 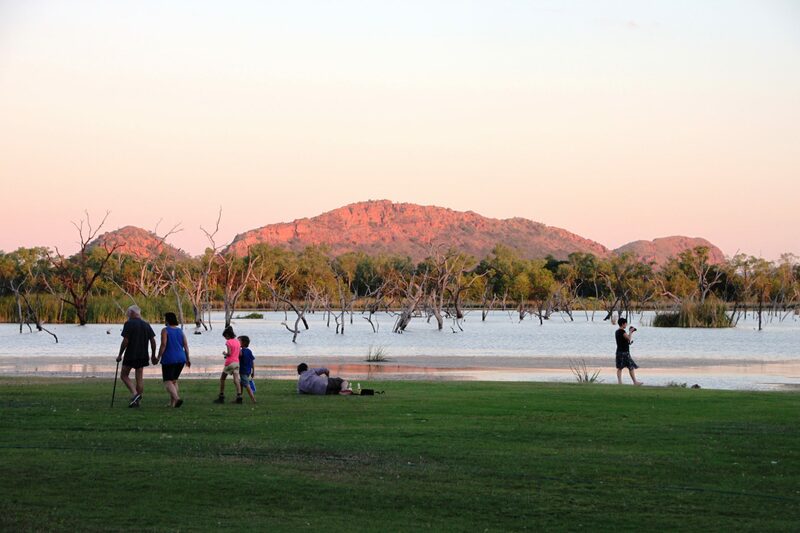 Settle in at Kununurra for a while if you’re visiting east Kimberley attractions. This is another town that also gets busy. There are several caravan parks available, and those that have waterfront views can book out the quickest, so your timing is critical for booking ahead if you’d like one of these sites. Around Kununurra, popular attractions include the rum distillery, sandalwood products, and Lake Argyle, to name just a few. Aboriginal art is quite unique in the Kimberley, so to see some excellent local art, visit Artlandish in the centre of town. One festival held each year that the whole family will love is the Ord Valley Muster. Held each May, the town overflows with people coming from all over Australia to enjoy the festival’s casual atmosphere and entertainment over 10 days. If digging for a diamond sounds a bit strange, this is just one of the activities offered during the muster. In our case, Grant did just that and won a magnificent Argyle diamond. 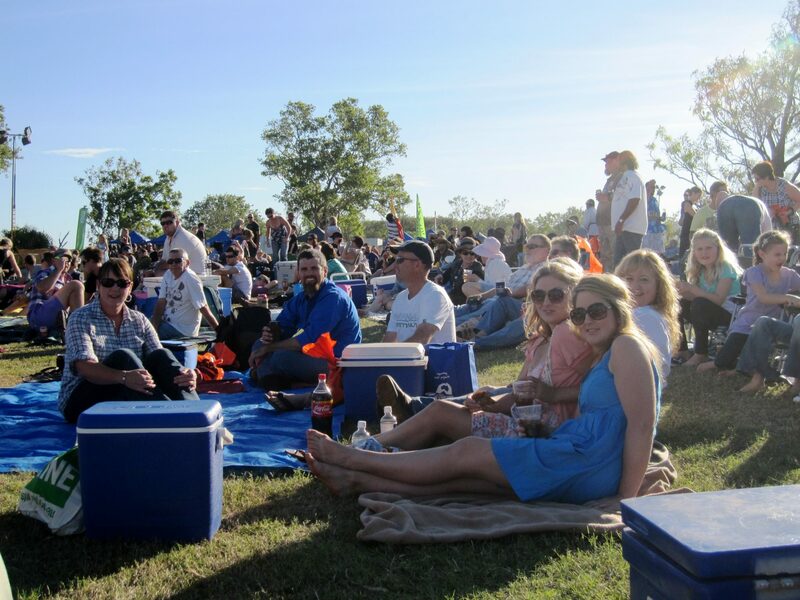 The pinnacle of the event is the Kimberley Moon Experience where you bring your rug, picnic hamper, and an esky, and enjoy a fantastic open-air concert under a full moon. Western Australia’s most northerly town is Wyndham which is very popular for its Five Rivers Lookout. Being able to see these magnificent major rivers converging is an amazing site, and in the late afternoon, it’s a top spot to have happy hour! 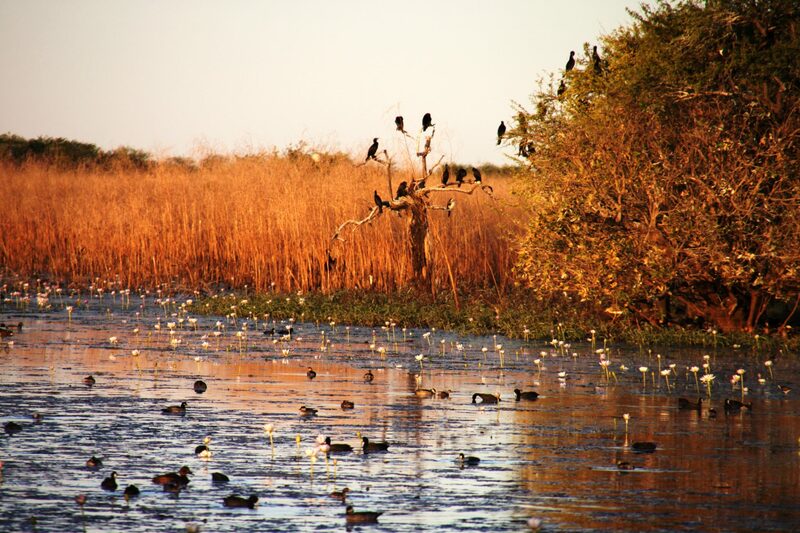 Not far from Wyndham is Parry’s Lagoon Nature Reserve which is a haven for breeding waterbirds and lurking saltwater crocodiles. The Reserve is easily accessible from the Great Northern Highway and the birdlife is best seen in the early morning or late in the day. I’d suggest booking in at Parry Creek Farm that’s located in the reserve around midday, and then make your way down to the lagoon before sunset and again before sunrise, to watch the birdlife from the boardwalk and bird hide. Heading back towards Kununurra lies another great attraction, the Grotto. It’s a spectacular large and deep rock pool that is a wonderful swimming spot early in the dry season, if you are prepared to climb down (and back up) 140 steps! The King River Road is not far from the Grotto and leads to the infamous Karunjie Track. 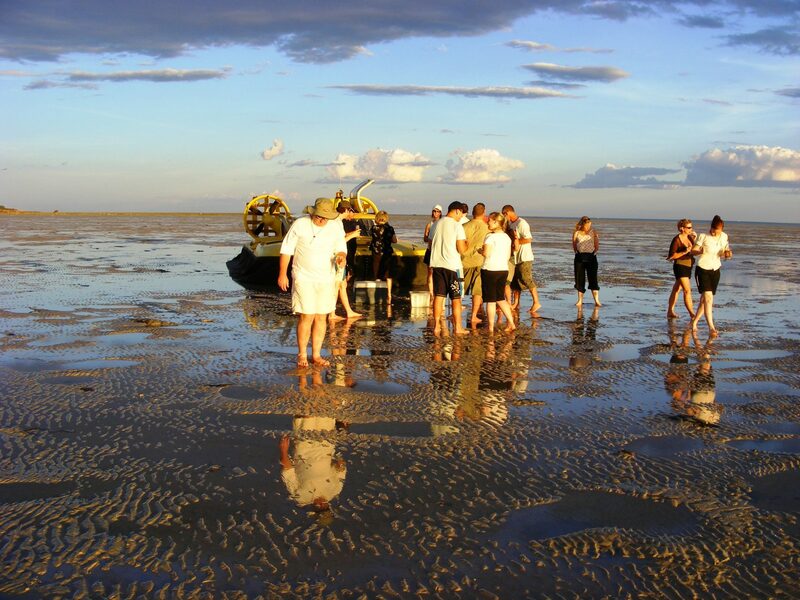 If you have a 4WD and looking for a unique Kimberley sight, drop your tyre pressures and drive 38kms to reach the amazing mudflats, where you can see for miles! You’ll probably have the place pretty well to yourself with the amazing Cockburn Range as a backdrop. Absolutely magic! If the call of the Kimberley is whispering to you, spend some time planning to turn what will be a great trip into the trip of a lifetime. Your research doesn’t have to be a daunting process – check out internet forums, blogs, travel guides, or ask us! The Kimberley call can be persistent, so take the time to plan and enjoy your visit, and come away with a little of the Kimberley spirit just as we do!